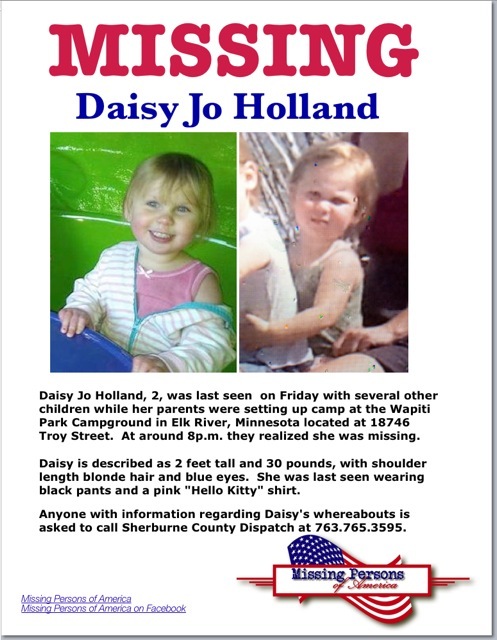 UPDATE 5/27/13 – The body of little Daisy Jo has been found. She would have celebrated her second birthday tomorrow. She was found downstream from the family campsite in the Elk River on Sunday. Previous story: A toddler has gone missing in the Wapiti Park Campground in Minnesota. Daisy Jo Holland, 2, was last seen on Friday with several other children while her parents were setting up camp at the Elk River campground. Around 8p.m. they realized she was missing. Elk River Police have done land, air and water searches looking for her. Daisy is wearing the pink and white striped jacket with the turquoise trim in the picture that she was wearing when she went missing. She also has on black pants and a pink “Hello Kitty” shirt. If you have any information to her whereabouts, please call the Sherburne County Dispatch at 763-765-3595. Call 763-241-2599 for information on how you can volunteer to help search. Click here to listen to the scanner.